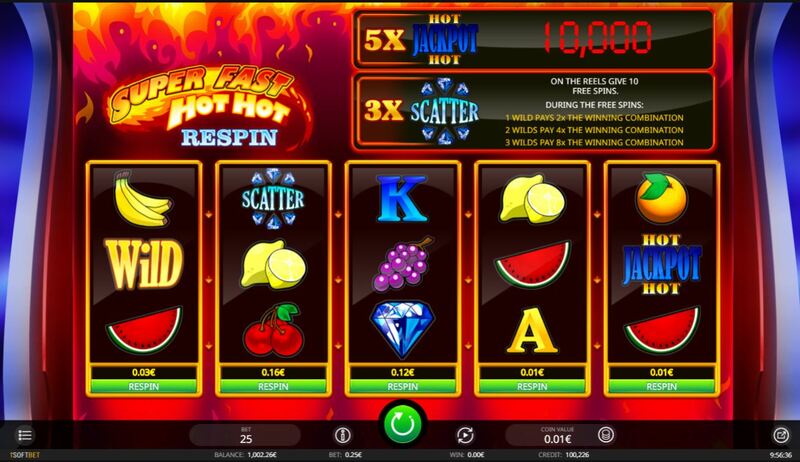 Super Fast Hot Hot Respin slot gives us a clue in the title as to the retro theme it has and in this respect it doesn't disappoint. This is the second time iSoftBet have used the old look after their Booster game and other developers such as Novomatic have consistently produced them with titles such as Roaring Forties and Ultra Fruits. The drawback can be (as we have here) the awful 1980's computer-generated music that makes the soundtrack and lack of animations - perhaps the developers like this type of theme solely because there is less work involved in the design, who knows? Anyway, as long as our bankroll doesn't disappear 'Super Fast' we may actually discover this is a decent slot! There are 5 very basic reels with black background and 3 rows with 25 paying lines. The icons can be stacked so you may see 2 on each reel and they take the form of traditional fruit machine symbols. Your 5-of-a-kinds aren't very big though which gives us a clue to the lack of volatility here: Diamonds, Melons, Grapes, Bananas or Lemons pay 6x bet, Cherries or Oranges 5x and 4 card values all paying 4x. That's only 3 different pays across 11 symbols but there is a 12th. 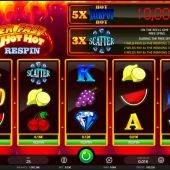 icon, the Hot Hot Jackpot one which will pay 400x. You get Wilds too which will match the highest pay of 6x but won't count as a Hot Hot Jackpot substitute. If you see 2 Diamonds on reel 1 you are given 2 respins in which all Diamond and Wild symbols are held in place but Wilds will not count as this respin trigger if 2 land on reel 1. This is essentially a 'buy' so you can choose to pay the price offered to respin any 1 reel while the others remain in place, similar to Microgaming slots such as Reel Gems, Wild Orient and Dragon Dance. You can do this as long as you like until the desired symbol appears - at a price! Three scatters in view anywhere triggers 10 free games. You can retigger them but don't get pays for the scatters themselves. Your enhancement is that Wilds now double wins, and you can get up to 8x on any win which contains 3 or more Wilds. You can still trigger the respin feature too.